Although this is a new calendar year, the growing year is already underway. It begins in late summer or early autumn, when many overwintering vegetables are sown and when soil begins to be made ready for spring sowings and plantings. 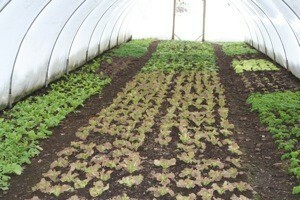 The first picture is of outdoor salad which was sown in late August, after potatoes. 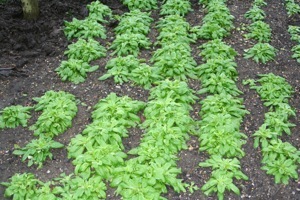 Less than thirty weeds have been pulled from this whole bed since the salad was sown. In my garden now (30 December) there are spring cabbages half grown, purple sprouting broccoli to flower in March and April, garlic and broad beans two inches high, and lots of salad plants undercover. 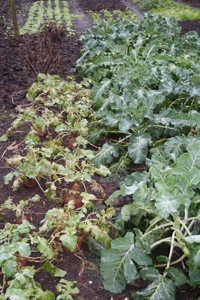 There are also swedes and savoy cabbages ready to harvest now, from plantings in July after lettuce had finished. Most beds are bare and are covered with one to two inches of well rotted cow manure, or home made compost, or spent mushroom compost. 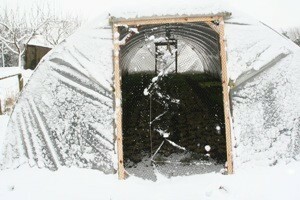 The frost has already weathered these composts and broken into their lumps. In any drier, frost free interludes through winter one can run a rake across the top of and through the compost to break it down into a finer tilth: I have already done this on my dig / no dig beds. Do carry on gardening through the winter, so that you are ready by mid March, for example, to sow parsnips and broad beans. Any fine days in winter are really precious for all those catching-up jobs which otherwise spill over into the busier springtime. Winter weeding is highly worthwhile and often neglected. Pruning of apple and pear trees can be done in frosty weather, although most reference books tell you not to. And if you are taking on a weedy plot, this is a good time to start mulching (see No Dig Growing on this site). 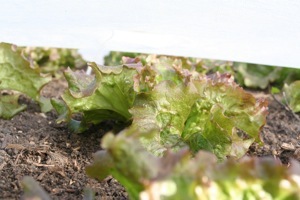 There is only one vegetable I sow in January – lettuce in the greenhouse, with some gentle heat from electric propagating cables which are set in a bench of wet sand. 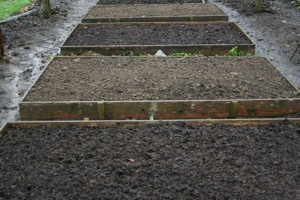 Seed is sown in a tray, then pricked out into modules in early February, to have plants by mid March which are covered with fleece after planting. First leaves are usually ready by mid April and are then picked weekly off these plants until July. So this one sowing is providing salad for three months. To help you decide what to fill up your precious free soil with, vegetable wise, I offer a few observations on the more popular choices. Courgettes are productive but require lots of room, up to three feet in all directions. Squashes will also roam and don’t wait for a passport into the next allotment. Salad plants such as lettuce are fast growing and productive, but are always at some risk of being damaged or even destroyed by slugs. Keep them away from courgettes. Potatoes are fast and easy as long as you harvest them before blight appears in any wet summer fortnight, starting arond Glastonbury festival time. Strawberries – planted the previous autumn, or continued from the previous summer’s crop – grow easily, but are prone to rotting and slug damage if it is wet at fruiting time, often when the festival is on. Leeks provide food over a long period in the winter months, but take a long time to grow and need rich soil to grow big. They are easy to plant in the soft, wet soil at festival time. Climbing beans are prolific in summer but often peak while families are away on holiday. 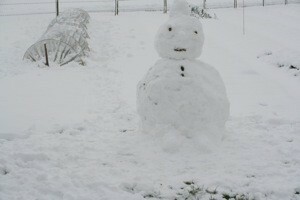 A good chance to make friends with non-holidaying neighbours. 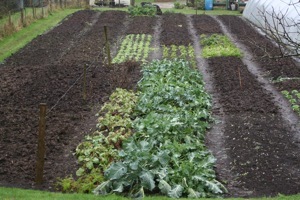 All vegetables thrive best in rich soil so spread as much compost and manure as you have or can afford. Worms prefer that it be left on top and directly planted into, and this results in less weeds, as long as you do not allow any to seed. I am often dismayed to see, on allotments, just a few mature weed plants such as sow thistle which are shedding thousands of seeds over a large area. Compare that to the small effort required to pull them out when small.